6/11/09 – Acquisition – Grenoble, Musée – A Flemish painter born in Liège, Léonard de France was a genre painter, known notably for revolutionary scenes which might be compared to those of Louis-Léopold Boilly. He also specialized in workshop scenes, reproduced in minute detail and which constitute a fine record of trades and industry in the late 19th century. The work acquired by the Musée de Grenoble from the Terradès Gallery in Paris represents a printing shop. On the right, there are some visitors looking at a composing-grill with the letters placed on it ready for the composition, and on the left, a worker is wielding a mallet to arrange the letters at the same height on a frame . On the wall, several signs indicate the various publications : Histoire des deux Indes by Raynal, Histoire Naturelle by Buffon, Recueil des édits de Joseph II and L’Antiquité dévoilée par ses usages by Nicolas-Antoine Boulanger. 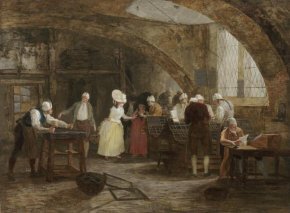 A matching painting showing the printing room is held in a private collection. The technical description of the scene was provided by the Terradès Gallery’s leaflet.